Redistributing and reusing resources is as important as buying new ones, in the current world. While there are a few NGOs involved with redistribution of clothes and books among other things, IU Cares has come up with a brilliant initiative, SEPC- to give every kid his right to play. IU Cares has put together SEPC- 'Sports Equipment Procurement Campaign', and IU Clubs has taken up the leadership to execute this project under the visionary leadership of Operations head of IU Clubs - Mr Mohan BN. Few from IU Clubs are engaged in this noble campaign where they collect sports equipment from their neighbourhoods and donate them to NGOs working with slum kids or directly to those residing in slums, for whom sports equipment would only be a dream. This campaign will not only serve those who are needy, but it will inculcate in those children who donate sports equipment, through this campaign, the habit of 'sharing', which is probably one of the deepest needs of the hour, as one section of the society struggles hard to meet the basic needs, while the other section has everything they need and more, and sharing within a home is a concept that is fast fading. "It is not how big a house you had, but how many you gave roof under it", they say. Sharing the last loaf of bread you had with someone who didn't have any is true nobility, encouraging children who have enough to share right from a young age is breeding nobility! IU Cares, through this brilliant and heart touching initiative, have shown that they truly care, for sharing is caring after all. He who truly cares, SHARES!!! 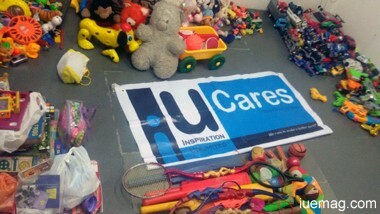 For joining hands with IU Cares Foundation or Contributing your bit - log on to www.iucares.org. Any facts, figures or references stated here are made by the author & don't reflect the endorsement of iU at all times unless otherwise drafted by official staff at iU. This article was first published here on 19th November 2014.